After sighted Spotted flycatchers in the morning story posted on http://www.escapeintothewild.net/2016/10/spotted-flycatcher.html , we continued our search for Rufous-tailed scrub robin at afternoon. We never see this bird before. And frankly speaking it was not even possible for us to sight this bird without generous help from my birder friends DIlipsinh Chudasma , Ashu Gohil and Nirav Pomal. They made our dream true by sighting the Rufous-tailed Scrub Robin. 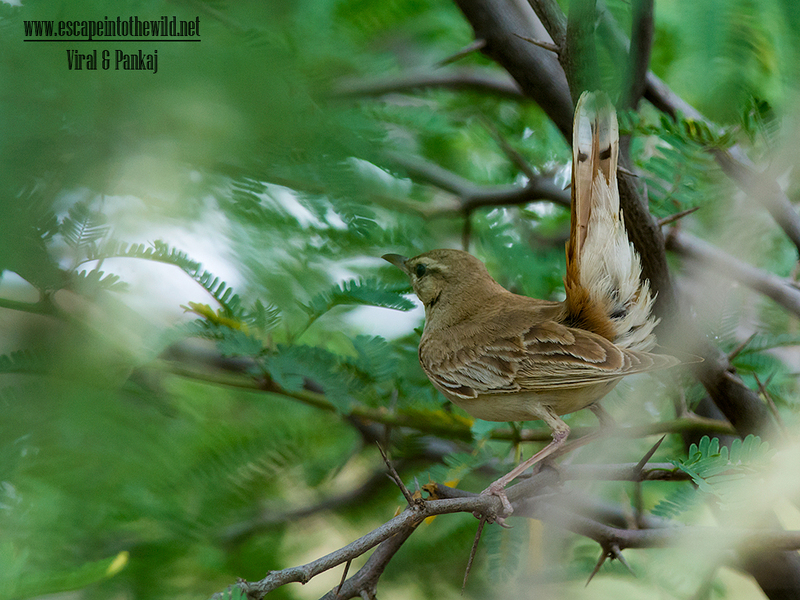 As per opinion of Dilipsinh Chudasma Rufous-tailed scrub robin are usually resting under bushes at afternoon times to avoid direct sunlight. They already know probable area to search for Rufous-tailed scrub robin. 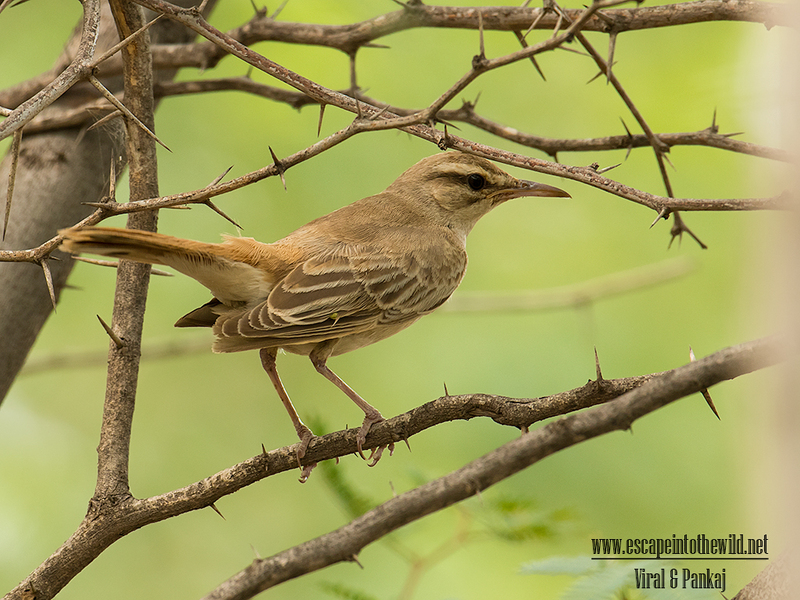 After some look out in Prosopis juliflora (ગાંડો બાવળ) shrubs, we sighted a single Rufous-tailed scrub robin. Rufous-tailed scrub robin is cautious bird. Although its not afraid of us it always kept a particular distance from us. This too remains in same area while flying low in the bushes. It is heavily camouflage in Prosopis juliflora shrubs plus brown sandy soil. At one moment we can clearly see it flitting among bushes and at the second moment its disappear, only to reappear from same bush after several moments…just like playing hide-n-seek with us. It’s frequently seen on the ground, chirping and hopping around, flaring, and bobbing its tail up and down. When it perched also displays its tail in this way. It is its significant robin-like pose. We succeeded to take various shots after some efforts. It has brown upper parts, whitish under parts, and a prominent whitish eye-stripe. The long rufous tail is frequently fanned, showing the black and white tips of the tail feathers. The adult male and female have similar plumage and the juvenile resembles the adult but is paler. These birds feed on insects such as beetles, grasshoppers and the larvae of butterflies and moths, and on earthworms mostly caught on the ground. It has a clear lark-like soft call. Rufous-tailed scrub robin is winter guest in Gujarat. Its habitat is dry scrubby open country with patches of dense bushes in lowlands or foothills… so Kutch is ideal venue for them. It also found in other parts of Gujarat but here in Kutch they are numerous.